Hydration* Heals status problems if it is raining. This Pokemon is cured of any major status effects during Rain Dance. POK�MON is promised a loving relationship that never ends. 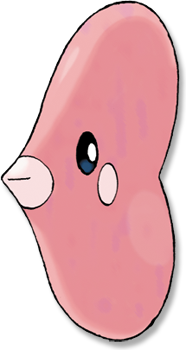 Emerald LUVDISC make the branches of CORSOLA their nests. There is a custom from long ago of giving a LUVDISC as a gift to express one�s feelings of love. Leaf Green During the spawning season, countless LUVDISC congregate at coral reefs, turning the waters pink. Diamond/Pearl It lives in warm seas. It is said that a couple finding this Pok�mon will be blessed with eternal love. Platinum It lives in warm seas. It is said that a couple finding this Pok�mon will be blessed with eternal love. Heart Gold Its heart-shaped body makes it popular. In some places, you would give a LUVDISC to someone you love. Soul Silver Its heart-shaped body makes it popular. In some places, you would give a LUVDISC to someone you love. Black It lives in warm seas. It is said that a couple finding this Pok�mon will be blessed with eternal love. White It lives in warm seas. It is said that a couple finding this Pok�mon will be blessed with eternal love.